The Sims franchise is one that has gained extreme popularity ever since the day it began way back in early 2000. However, no two The Sims games have gathered as many comparisons and debates as the two latest releases, The Sims 3 and The Sims 4. This has sparked today’s topic as well! The Sims 3 vs The Sims 4, which one comes out on top, and how do they compare against one another? The worlds within the two games are vastly different. The Sims 3 was developed with an open-world type of an approach that allows the player to go out into the world and explore the neighborhood, which is not a possibility in The Sims 4. Here you will get a loading screen with your every move, which while not long, sometimes may still feel as a disturbance to the fluidity of the game. While the goal here is not to count points, if you want to do so, The Sims 3 seems to take the first point in this The Sims 3 vs The Sims 4 comparison! Most Sims players have spent endless hours trying to get their character to look just the way they want to. A good case can be made for both games being their best, in the end, it comes down to personal preferences. The Sims 4 introduced a hands-on interface, which is incredible! Here you’re able to customize the looks of your character not by sliders but rather by directly pushing and pulling bits and pieces. This allows creating more distinct facial features as well as more distinct body types, allowing the player to change the character on a microscopic scale. When it comes to character creation The Sims 3 has its own word in The Sims 3 vs The Sims 4 matter! The ‘Create a Style’ feature is gone in The Sims 4, which means that you can no longer change the colors of clothes and objects freely. You can do that in The Sims 3, which opens up a new world of customization opportunities. The Sims 3 also offer such things like a makeup slider, body hair, and different height for teens that have been removed in The Sims 4. Not much of a discussion here, really. The Sims 4 was released 4 years later than The Sims 3, it had access to better engines and better overall capabilities. There is no reason for The Sims 3 vs The Sims 4 rant here, the graphics are simply better in the newer game. No surprises here! Story progression is a feature that was a big part of The Sims 3 and is no longer there in The Sims 4. This feature has kept the lives of your Sims going even if you weren’t paying attention to them for the time being, maintaining the natural progression in the game. This means that if you’d forgotten about your Sim for a while, you might come back to him or her being married and having children or even carving out a new career. It does not necessarily mean that the story-comparison of The Sims 3 vs The Sims 4 makes one game better than the other. If you want to take care of every move your Sim makes when you play, you won’t notice it not being there in The Sims 4. However, with the feature being easily turned on and off in the previous game, it simply added more flexibility to the gameplay. This one is open for opinions, however, The Sims 4, without any DLC content installed, feels somewhat empty, as even some of the basic necessities, such as pools, are missing. The same goes with the toddler stage in a baby’s development, which is gone in The Sims 4. If you want to compare The Sims 3 vs The Sims 4 without any DLC content installed, The Sims 3 simply has more options to choose from. However, once the DLC’s are taken into the consideration, there is so much for the player to go through and enjoy, that a lack of content is not likely to be felt at any point of the game! Home Builder vs. Life Simulation? While it is true that both The Sims 3 and The Sims 4 come from EA and have the same developer team behind them, the games are played very differently. Both of them have their unique strengths and it is up for the players to choose with which piece they prefer to go, within the battle of The Sims 3 vs The Sims 4! For the sake of argument, let’s assume that both games have all of the DLC’s installed, bringing them to the maximum amount of possibilities within the game. When it comes to the game being a real-life simulator, The Sims 4 takes the cake. There’s simply more to the social aspect in this game, as multitasking has been introduced. This means that finally, the Sims can communicate with other Sims while also taking part in some kind of activity. For example, you can just hop into the kitchen and have a chat with the Sim that is currently cooking. Another part to The Sims 3 vs The Sims 4 argument is the emotions of the Sims that play a much bigger role in The Sims 4. This is partly due to the better graphics, as you can now often tell your Sims mood by simply looking at their face. Also, without the story progression feature being there, you are more immersed in actually taking part in the life of your Sims! Now when we come to the building aspect of the game The Sims 4 has its perks, however, there is certainly more to the game in The Sims 3, both with and without the DLC’s. 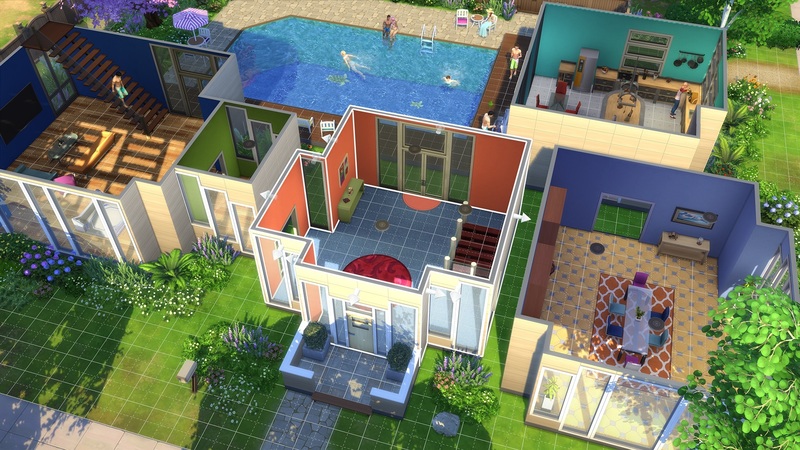 If you like to let your Sims get loose every now and again and put your own focus on designing the interior or setting them with a new home, The Sims 3 vs The Sims 4 battle is arguably won by the latter. If you came here seeking for a simple answer on which game is better, sorry to disappoint. There is no single answer. Both games excel in their own respected areas and it must be said, neither of them is perfect, however at the same time, both of them are very enjoyable. The casual Sims fan won’t feel much of a lack by choosing either one of the two and if you plan on spending hundreds of hours by playing Sims – weigh your options. When it comes to The Sims 3 v The Sims 4, the only winner is you, as both games are more than worth your time and effort!